Latest PoCOM version is ? Improved measurement values and fault codes. Also added some subsystem control units. 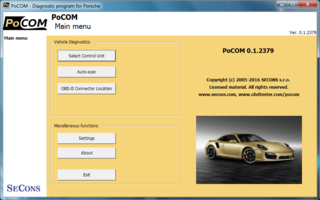 PoCOM is diagnostic tool for Porsche. It supports all OBD2 compliant vehicles since 1996. We tried to maintain compatibility with PIWIS and PIWIS II dealer tools where possible. Also people who use VAG-COM/VCDS® or used Durametric scantool will be familiar with the application. PoCOM comes with OBD2 to USB interface and is designed to work on Windows 2000/XP/Vista/7/8/10 or Linux or Mac OS/X (using Wine emulation). Hardware requirements are very low compared to dealer-tools. Our OBD2 to USB PoCOM interface contains 2 multiplexed ISO9141 K-Lines and L-Line, high-speed CAN-BUS and analog measurement circuits. Supported protocols include KW-71, KW-1281, KWP2000, VW TP1.6, VW TP2.0, ISO15765 and UDS ISO14229. We do not supply Porsche round connector at this moment. Pre-1996 Porsche models with round Porsche connector are covered, but third party adapter must be used and functionality cannot be 100% guaranteed. Durametric/Sensolutions adapter should work with PoCOM, in case of any problems, please contact us. Please use our contact form if you wish to get more information about PoCOM. We provide standard 2-year warranty for our products. In addition to documentation below you migh find useful also DiagWiki.com tutorials related to PoCOM.